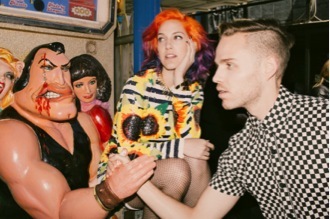 MS MR are embarking on their first headlining North American tour this fall in support of their debut Secondhand Rapture. Kicking off September 16th in Montreal, the tour includes stops in Philadelphia, New York City, Boston, Minneapolis, Chicago and Los Angeles, as well as appearances at summer festivals Glastonbury, Splendour in the Grass, Lollapalooza, Rock En Seine, Outside lands and Austin City Limits. The tour announcement follows MS MR”s late night TV debut last month on the Late Show With David Letterman, during which they performed their single “Hurricane,” and a recent west coast tour that garnered the duo rave reviews. View the full of list of tour dates below, and watch MS MR perform “Hurricane” on David Letterman here.